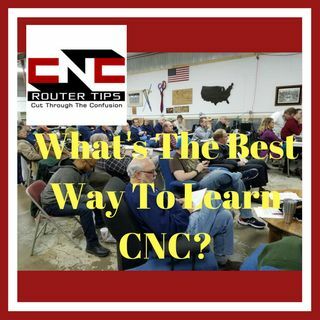 CNCRT:59 What Is The Best Way To Learn CNC? In this episode of the CNC Router Tops Podcast, Bill Griggs answers a listener's question, "What is the best way to learn CNC? This is a very smart question although it may seem simple at first glance. The best way to learn CNC will be the most efficient, quickest and most thorough method. Learning CNC quickly while still getting all the bases covered is a real chore on your own. When you decide ... See More to learn CNC you have to have your end goal in mind. A person wishing to learn CNC for a hobby will have different goals and time lines than a person who plans to use CNC to create a business. Focused precise topic are the best way to guarantee your success. Learn what we recommend as the best way to learn CNC for your CNC Router Table and why. Disclosure: Please note that some of the links below are affiliate links, and at no additional cost to you, I will earn a commission if you decide to make a purchase. Please understand that I have experience with all of these companies, books, tools and I recommend them because they are helpful and useful, not because of the small commissions I make if you decide to buy something. Please do not spend any money on these products unless you feel you need them or that they will help you achieve your goals.